Its the midst of summer here, hot and humid,,,,rather yucky imho (*in my humble opinion). But there are some things about summer which I do enjoy alot and that is some of the things that grow and fruit in this season. However, this is about medicines, in tinctures. How I decided to embark on this is a bit of a long story, but suffice to say I needed something to calm me down and quick. I had begun to take some Chinese herbs that help to lose weight, not that I'm fat, but I want to lose a very obstinate 20 lbs, and without all the work I used to do as a bodybuilder and jogger. I know, not likely, but I do believe in miracles and am holding out for one! So I had taken these before and felt nothing and did lose the size, but they were pricey. I found them again in a Chinese market for much less but these made me so jittery and speedy and way too uncomfortable. I checked the labels and they were identical, but I responded so differently this time and felt like I was on another planet. (well...that's up for debate). I am hyper sensitive to any medications or anything, and these felt like I was on way too much Benadryl and caffeine both. I drink coffee rarely for this reason too. On top of that another herb I was taking was also ''energizing'' me and I had a really rough few days let me tell you! I decided I was having a major ''issue'' (before I realized it was the herbs), and decided I needed some serious medicines and decided to make some natural calming infusions. I looked into my favorite herbalist and forest witch Susun Weed as she always offers the most practical and simple ways to do things with the natural plant kingdoms as living conscious beings, so I love her and her work. She now has her own youtubes for demonstrations. I went to the healthfood store armed with my herb list for the bulk herb section and the blessing was that all the herbs were just restocked, fresh, fragrant and rich in color. I spent a full 20 minutes picking the various ones, labeling them and bagging them and got some extras....like Rose Buds! So..... I made an infusion that looks beautiful in a large 2 quart mason jar and have been drinking it, before I realized once the herbs wore off, that the anxst was the herbs. 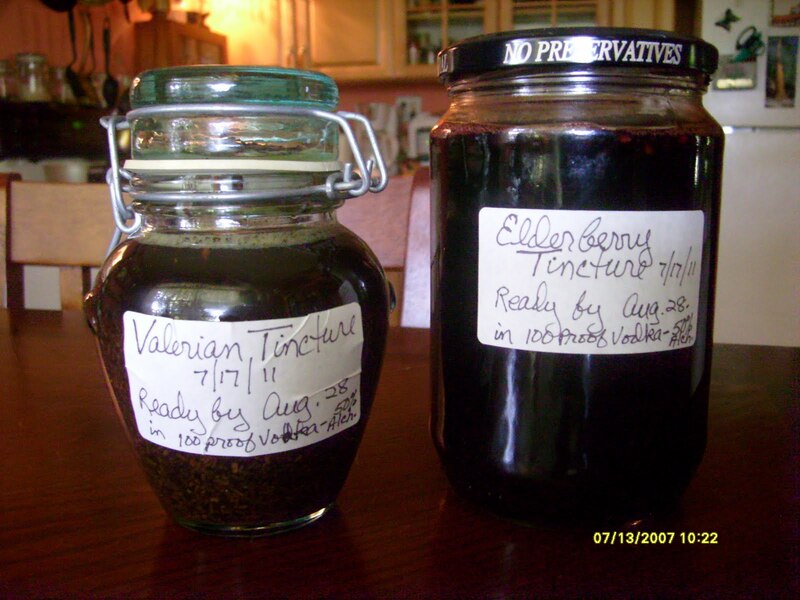 However, the infusion made and gone by now, I also made 2 tinctures, one of Valerian root and one of Elder Berry. Tinctures are different in that they are made with a solvent like Vodka which extract the medicines out of the tougher parts of the herbs which are usually dried roots or berries as in my case. Which meant I had to go to an liquor store LOL and that was a funny/strange thing because I don't drink and those who do ''feel'' funny to me. The man behind the counter was an ''intellectual'' trying to impress? describing the various textures of the vodkas available. I sure needed help! seeing the whole wall filled with all kinds of vodkas and had no idea how to choose. I assured him this was not about taste or flavor because it was for making medicinal herbal tinctures. He stopped in his tracks LOL and blinked quite a bit, obviously never hearing that before in all his years, but I had asked for a good quality one which is what I heard recommended for tinctures. After all his long schpeels, I chose one, but when I went back online to make sure I had the process right, I realized I needed 100 proof vodka, and had to go return the one I had and buy another. My previous ''intellectual'' helper came in just after me for his shift, saw me there, inquired as to the health of my herbs lol and I told him I needed 100 proof vodka. I got the large bottle this time. When I was back at the register to pay for my bottle, he shooed the cashier there away, to ''take this one''. I smiled. He again asked how the herbal process was going. I asked him if he knew how to make wine out of Muscadine Grapes because I had quite a crop this year, and he said no....but asked if I would sell the tinctures once made. I said if they were really good, probably not....because I will need them, but if I had extra, yes. These will be ready in August. The Valerian Root is for calming, is sedative and relieves anxiety and helps insomnia. The Elder Berry is known for colds, flues, coughs and the like, actually boosting the immune system. I usually dont' have those, but just in case I bought them because they were fresh, and because they were so pretty lol and I'd heard how wonderful they are. And when I saw a little girl making the tincture herself I just thought I needed to try it myself because it is too easy, and such a powerful medicine. So, if I ever need it I will have it.